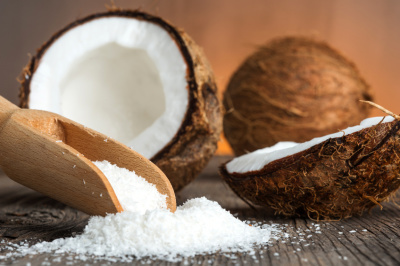 Our products are made with all-natural pure coconut oil and only the finest ingredients and essential oils. Everything is handmade and molded. We have launched the current product line with some of our top sellers and favorites. In time as we expand and grow we will enhance our product line. Our scrubs are made with all natural coconut oil, demerara sugar and essential oils. Individual Ingredients by item can be found on our Ingredients page. - Please ensure the scrub is kept above 75 degree Faraeheint. If the scrub looks solid it is because coconut oil is solid at room temperature. If so, immerse the bottle half way in hot water ensuring no water enters the bottle and keep it there for 5-10 min. or set the bottle out in the sun for 15-20 min. Stir the contents so now the scrub is at its optimum. 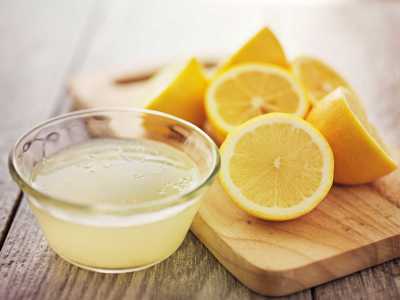 - Please use the wooden spoon provided or any clean, dry spoon to stir it up and then take out 1 teaspoon of the scrub and place it in your palms. Ensure the area you are applying it to is moist (with water). 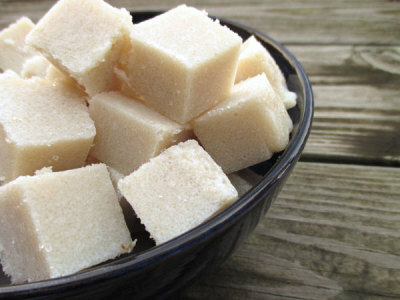 Apply the scrub on your thighs, buns, legs, upper or lower arms as desired and work it in until the sugar dissolves. Apply more scrub as desired to all the areas you would like to work. Specifically, for CoffeLove - For further cellulite reduction please keep the scrub on for 15-20 min. Effect can be enhanced for reduction areas by binding them with ceranwrap as well. - Once complete please wash off in the shower with mild soap. 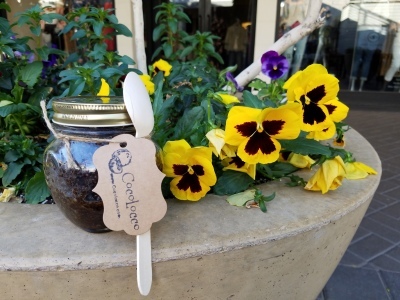 Not only will this gourmet coffee scrub awaken your senses but will also help reduce cellulite in those stubborn areas. Along with a good diet and exercise, your skin will be tight, invigorated and will glisten and glow. A warm citrusy blend with notes of lime, mint and coconut. Kick start your morning or use it after a hard work out to clear thoughts, soften up your skin and spritz up your day ! Warm up your weekends, brighten up your mornings, or liven your nights with this smooth blend of sugar, almond oil and soft coconut oil to awaken; sparkle your mood and senses. 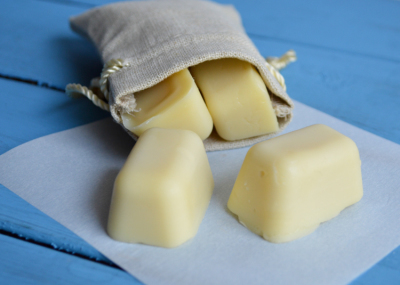 Our solid scrub cubes are made with either our goat's milk or our clear glycerin soap base, all natural coconut oil, sweet almond oil, pink Himalayan sea salt, sugar, demerara sugar or sea salt and essential oils. Individual Ingredients by item can be found on our Ingredients page. 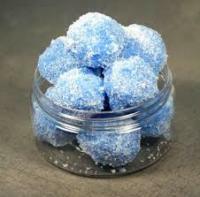 - Please keep the cubes in a clean, dry, ventilated soap dish or in a tin for optimum results. 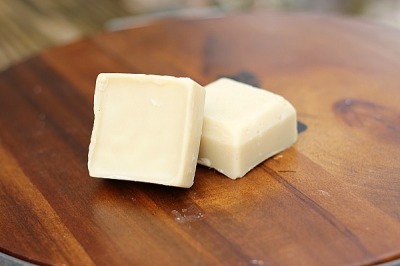 Use the cubes like you would a soap but with the extra coarseness to remove dry skin. These are ideal for when you are on the go and don't have the time to use the oil scrubs but would still like the exfoliation and the moisture. - Once exfoliation is complete please wash off in the shower with mild soap. Let the warmth of pure whipped coconut oil and sugar clean and energize you for a new beginning. 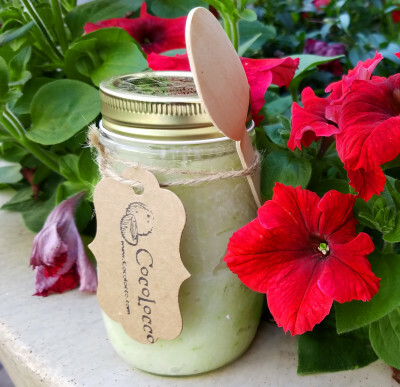 This mild yet sweet scrub will have you moisturized and softened like the finest silk. Not only will this gourmet solid coffee scrub awaken your senses but will also help reduce cellulite in those stubborn areas. Along with a good diet and exercise, your skin will be tight, invigorated and will glisten and glow. 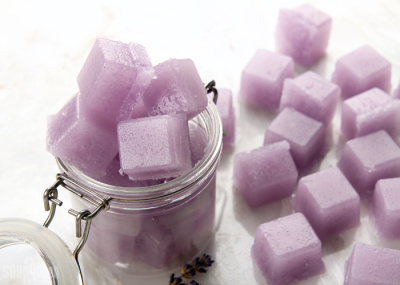 Ease those tight muscles and sore back with a rub down with our Lavender EpsomLove cubes. Excellent after a hard work out or a strenuous day, when all you want to do is relax! This sweet blend of lemon, sugar and coconut oil is sure to brighten your spirits, lift your mood and leave you with baby soft skin. 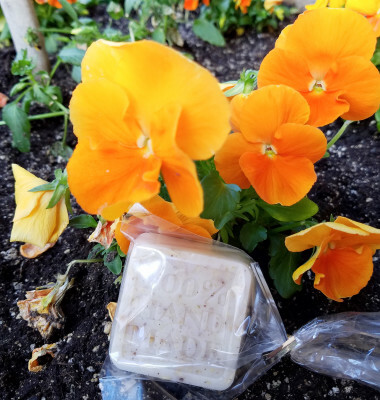 The soft floral blossom scent of this soap with the addition of pink Himalayan sea salt and rose petals will get you ready for that special night. Not only does it exfoliate but it also hydrates your skin. This particular blend of sweet almond oil and honey smells good enough to eat ! This rich blend will keep you moisturized and is a great way to soothe the skin, as well as reduce inflammation and heal dry, itchy skin. 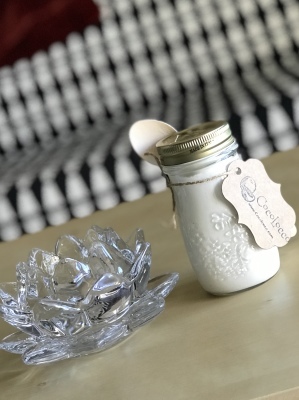 The soft woody aroma of rose oil and almond meal enhances your mood and works as an aphrodisiac to set the ambiance for that special date night or a warm cozy night cuddled up with your favorite book in front of the fireplace. This is a special organic goat's milk base flavored with a chocolate macadamia nut coffee. This 100% Kona coffee is enhanced by the flavors of dark chocolate and macadamia nut which takes a full city roast to a different level. 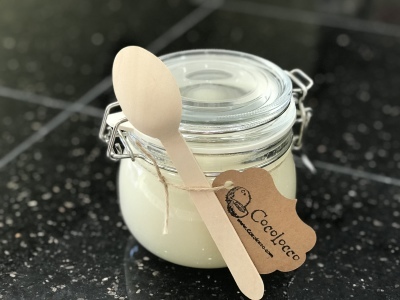 This is a special organic goat's milk base blended with a earl grey creme that is a smooth infusion with bergamot overtones and a creamy vanilla finish! A majestically smooth confection that is now available any time the senses desire. 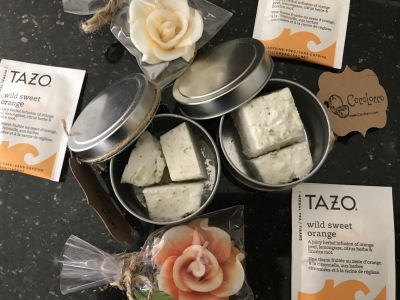 These soaps are made with our organic goats milk base and are specially molded in pretty shapes of koi fishes, dragonflies, butterflies, bees, etc. Usually found in our seasonal soap gift boxes. 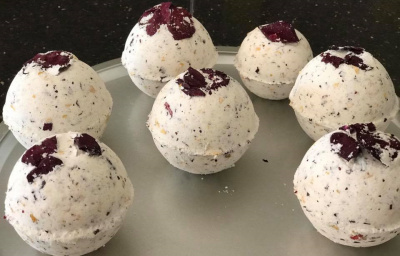 The difference between the bath fizzes and the truffles is that the truffles have a lot more oil in them to help moisturize better. 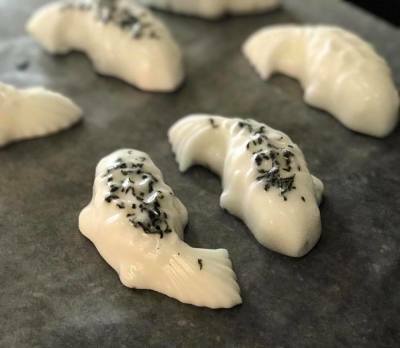 Both fizzes and truffles could have baking soda, cream of tartar, citric acid, Epsom salts, premium processed Dutch whole milk powder, coconut oil, essential oils, rose petals. Individual Ingredients by item can be found on our Ingredients page. 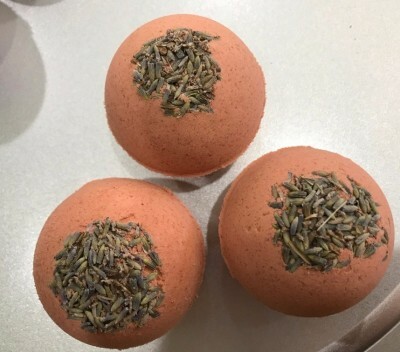 Speciality Message Bath Fizzes can be ordered on request with a message inside at $10 for the large size. - Please keep them in a cool place preferably in an air tight container till use. - Light some candles, and tune into your favorite station. 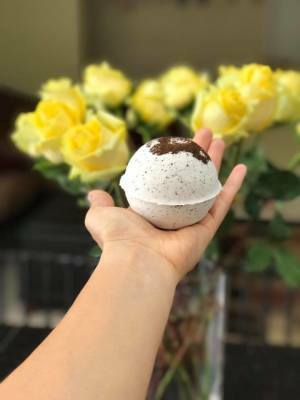 Fill your bathtub with hot to warm water, then drop the bath bomb in gently, watch it fizz and luxuriate in the aroma while settling yourself in the tub with your favorite beverage. Soak in a warm bath of heady rose oil and Dutch whole milk powder with a smattering of pink & yellow rose petals like the Egyptian goddess you are ! A warm citrusy fizzy with top notes of grapefruit and warm lavender. Helps to soothe, and relax your spirits. A light and fresh start to those early spring mornings. 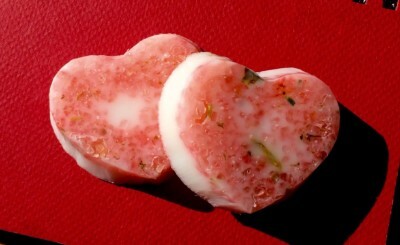 Ease those tight muscles and sore back with a soak in our Lavender EpsomLove hearts. Excellent after a hard work out or a strenuous day, when all you want to do is relax! 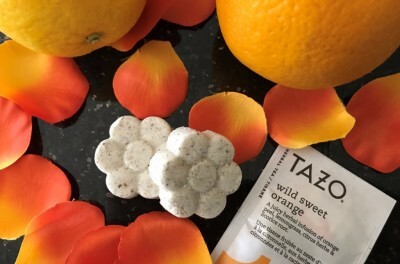 Wash away your worries in a warm tub with our favorite bath fizzy & surround yourself in warm citrusy aroma of wild sweet orange tea and Epsom salts. 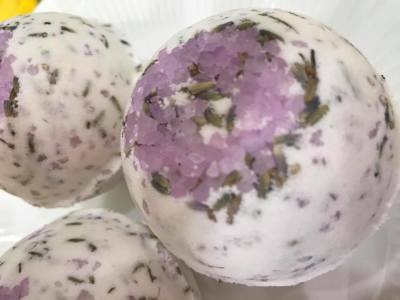 Sweet Wild Orange Truffles - Wash away your worries in a warm tub with our favorite bath truffle & enrobe yourself in warm citrusy moisturizing bath of wild sweet orange tea and Epsom salts. 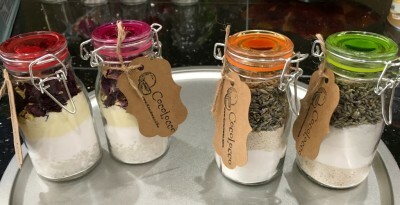 Baths are available in Lavender & Oatmeal featured on the right or Rose & Milk on the left. 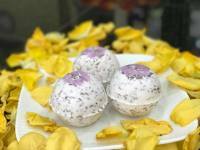 Baths may contain flower petals or buds, Dutch whole milk powder, oatmeal, Epsom salts & baking soda. Add a little coffee to your nightly soak to work away your cellulite and soothe your sore muscles after that amazingly hard run or hard day at work ! Soak your tired muscles in a warm scent of eucalyptus and lemon essential oils to soothe your sore muscles. Soak in a warm tub with our other favorite bath fizzy & surround yourself in warm citrusy aroma of lavender & wild lemon Epsom salts. 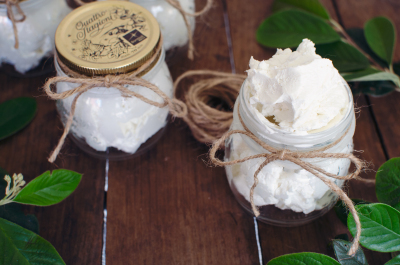 The whipped butters only have all-natural coconut oil, almond oil, and essential oils in them. It is a whipped emulsion of oils that is light, non-tacky yet is highly moisturizing as its all oil based. Individual Ingredients by item can be found on our Ingredients page. Also, available in Lemon Lavender, Lavender, Lemon and Chocolate Chai - all in 10 oz. bottles for $45. 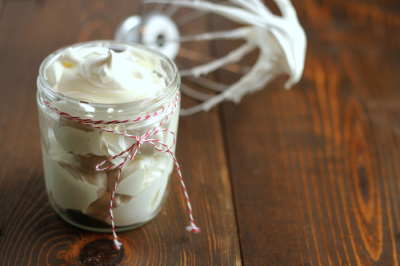 - The whipped butter will stay in a whipped formulation if it is kept close to 70°F or below. 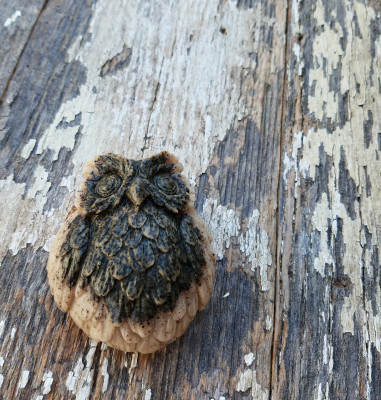 Please keep it in a cool place away from any heat source. - If you live in Arizona or a similar environment, please keep them in the fridge in the summers. Let the warmth of pure whipped coconut oil enrobe you in a soft silkiness and glow. This blend will keep you moisturized and smooth through the harshest winter conditions without a tacky or heavy feel. A warm woody blend of Eucalyptus with top notes of sharp clean lemon. Helps to clear thoughts, assists with concentration, and lifts the spirits. This particular blend of Bergamot and Lavender will help ease your anxiety & soothe your nerves. Bergamot's spicy sweet scent blended with Lavender's woody undertones makes this scent an essential part of your routine. 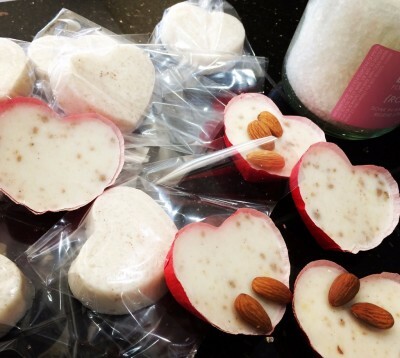 The lotion cakes only have all natural coconut oil, almond oil, beeswax and essential oils in them. Its a wonderful way to have solid lotion on the go. They will keep you well hydrated and moisturized. The cakes will stay solid if kept close to 70°F or below. They do melt a little when you put them in your hands as intended. Individual Ingredients by item can be found on our Ingredients page. - Please keep them in a cool place away from any heat source. You can store them in the fridge in the warmer months as well place them in a tin for travel on planes, etc. This spicy, warm blend of Clove & Orange essential oils will help warm your days & your nights and will become an essential part of your winter body regime. The soft woody floral aroma of this oil enhances your mood and works as an aphrodisiac to set the ambiance for that special date night or a warm cozy night cuddled up with your favorite book in front of the fireplace. Who doesn't like a little chocolate in their chai ! 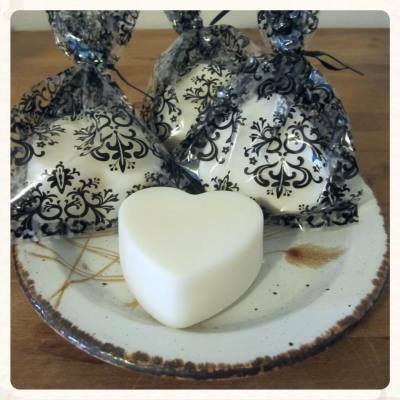 This new blend of cinnamon and clove with coco butter and coconut oil base lotion bar is all the rage to kick off Valentine's Day.